For the first time in Canada’s history, a Prime Minister has stood tall in support of Israel and the Jewish community. That Prime Minister is Stephen Harper. There will be an election on October 19. Justin Trudeau’s choice of advisors reflects his own bias. And that bias is aimed right at us. HAMAS used women and children as human shields in front of their rockets in Gaza – but Justin’s military advisor, Andrew Leslie, blamed Israel for civilian injuries. Leslie is now being touted as a candidate in Ottawa-Orléans. Omar Alghabra, the Saudi-born former president of the Canadian Arab Federation and a very close advisor to Justin told Al Jazeera, “on the issue of Iran, Trudeau has clearly stated that he is for engagement”. 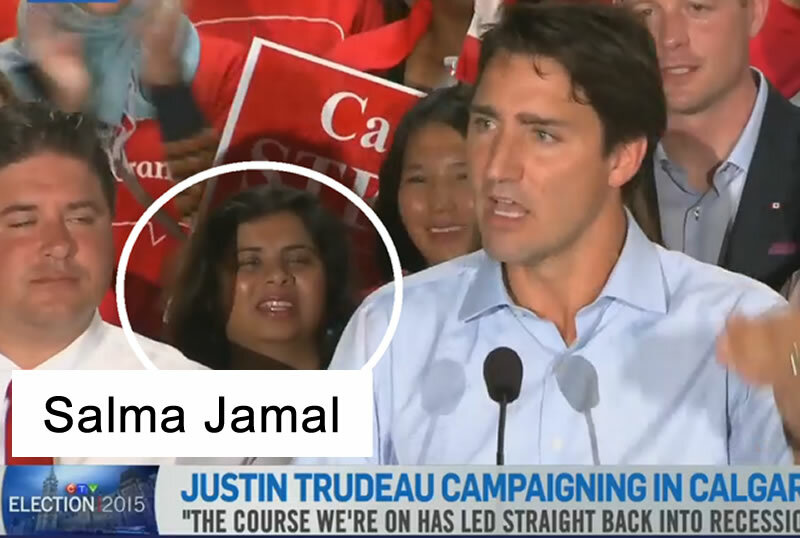 And the woman in the picture right next to Junior, Jamal, is quoted , “the Zionists would be foolish to show up at another protest in Calgary”. Sasha Trudeau produced the “New Great Game” in partnership with Press TV, Iran’s state-run propaganda agency, about Iran’s “courageous decision” to defy America and Israel. On ISIS, Trudeau Jr. said, “why aren’t we talking more about the kind of humanitarian aid that Canada could send them, rather than soldiers and CF-18’s”. “There needs to be a little bit of an attempt at responsible neutrality. Honour killings shouldn’t be called barbaric”. This is important enough and scary enough for me to be doing a repeat with more comment. Many of you are aware of a recent major conflict in our community. A very prominent Jewish philanthropist is entertaining Junior Trudeau this week – soliciting $1500 per person – $300 for the candidate and $1200 for the Liberal party. I was shocked to receive over 60 emails, all copies of the communication between the host and another prominent philanthropist who took offence to any support of Junior because of what you have read here and elsewhere. CIJA, Canadian Israel Jewish Advocacy, and CJPAC Canadian Jewish Political Action Committee both take the view that as community agencies, they must be neutral – they must not show any bias and must make all candidates’ positions known to the community. For sure – EXCEPT??? When it comes to issues that involve the Jewish community here and in Israel. Then the politics must be addressed as the fourth dimension. During a conversation with a very skilled community professional about this subject, she insisted that Trudeau was getting a bad deal. Trudeau was denying that Omar Alghabra , running for the Liberals in Mississauga, is a close advisor on his team – despite documentation to the contrary. He also insists that his brother Sacha has no influence on him. Trudeau has been a special guest at the Al Sunnah Al-Nabawiahi mosque which is in his Montreal riding. In 2013, the New York Times reported from information found in classified military documents that the Mosque was a “place where al-Qaida members were recruited, facilitated or trained”. When asked to comment, not only did Junior not explain, he defiantly insisted that “we in Canada have our own determinations for those sorts of things because the U.S. is known to make mistakes from time to time”. And when Canada added a Mississauga Muslim charity, IRFAN CANADA to its list of terrorist entities after the RCMP uncovered $15 million sent to HAMAS. Trudeau still attended and headlined an event sponsored by IRFAN. Junior’s comments to Peter Mansbridge when asked about the Boston bombings sums him all up. “We have to look at the root causes. There is no question that this happened because there is someone who feels completely excluded…we also have to monitor and encourage people to not point fingers at each other”. Brilliant. From a man who wants to be the Prime Minister of Canada. It fits into the mold of: “the budget will balance itself” and “send counselors to ISIS to learn what their issues are”. Shades of Obama and Jimmy Carter. When Canada sends military support to help defeat the butchers of ISIS and the Jihadists, it is mostly Muslim people being saved. And we must never forget about Elizabeth de Rothschild’s train ride to Ravensbruck Concentration Camp over seventy years ago. As the wife of Philippe de Rothschild, her family must have expected him to buy her way off that train and save her from the gas chambers. It didn’t happen. In some places, and to some people, the annihilation of the Jewish people is what they live for. So I am one of those who don’t buy into the Trudeau story. As a proud Canadian, I can vote my preference and so can you. I can also use my blog to try to persuade you to agree with me. Some great MP candidates – John Carmichael, Joe Oliver, Maureen Harquail, Joe Daniel, Jobson Easow, Jason Kenney and many more. In Willowdale, we are particularly lucky to have Chungsen (CS) Leung as our sitting MP. He is also the Parliamentary Secretary for Multiculturalism. Prior to entering politics, CS was an experienced and successful businessman and entrepreneur. He is also fluent in Mandarin, Cantonese, Taiwanese, Japanese – and that will be very helpful if I ever decide to write a blog in Asia. But there is an even more interesting facet in CS’ background. SHANGHAI! Jewish immigrants from Germany and Austria arrived in Shanghai in the late 30’s fleeing the rise of Adolf Hitler and the Nazis. During World War II, some 20,000 Jews also found refuge from the Holocaust in Shanghai. CS’ father had been in Shanghai during those dark years and was a part of the Chinese support team helping the Jews survive. Shalom Toronto, a local Israeli/Canadian weekly paper did an outstanding article on this story – written by Doris Epstein. Many copies have been made and will be distributed during the final days of the campaign but if you go online, you will find it there as well. So now the final countdown begins. Six more weeks. It is very exciting. Did we make the right choices? Did we reach as many people as we could? Did we miss anything? So don’t forget to vote! It is absolutely imperative that you exercise that right – a right missing in so many other countries around the world. And you don’t have to be Jewish to be vigilant – against corruption, against ISIS, against Assad, and against complacency. If we are not for each other, who will be for us?